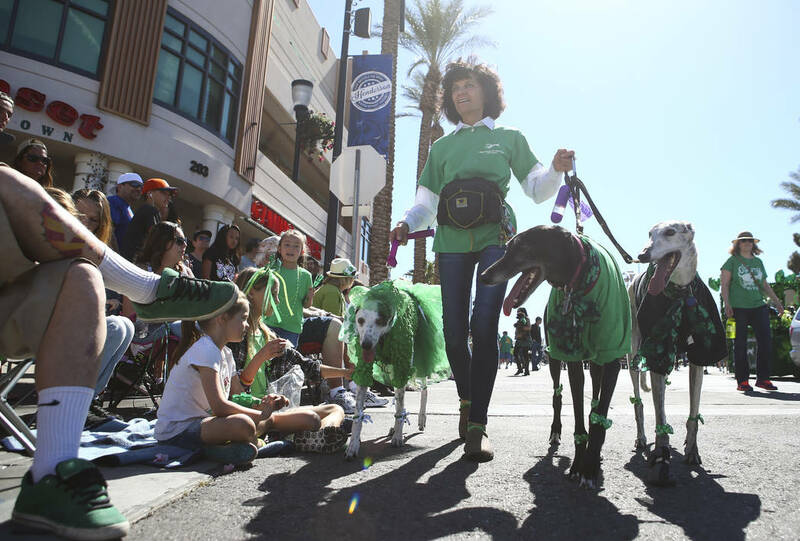 Chase Stevens/Las Vegas Review-Journal Dawn Barr walks her greyhounds, from left, Annie, Shadow, and Gunner, during the St. Patrick's Day parade in Henderson on Saturday, March 11, 2017. Americans plan to spend a record $5.9 billion to celebrate St. Patrick’s Day, which falls on Saturday, the annual survey by the National Retail Federation and Prosper Insights &Analytics shows. Projected spending for St. Patrick’s Day celebrations are the highest level in the survey’s 14-year history, up from last year’s previous record of $5.3 billion, the latest estimates show. The survey found that more than 149 million U.S. adults plan to celebrate the March 17 Irish holiday. That is up from last year’s approximate 139 million, the recently released survey shows. Consumers are expected to spend an average of $39.65 per person, up from last year’s previous record of $37.92. The holiday is most popular among 18-24 year olds, but 35-44 year olds will be the biggest spenders at an average of $45.76.